What are the key aspects to be kept in mind before buying Evaporation Boat for metallizing? What is resistivity of Evaporation Boat? Resistivity is a measure of the resisting power of a specified material to the flow of an electric current. A boat with low electrical resistivity will readily allow electrical current to flow through it, thereby failing to heat up. On the other hand, highest electrical resistivity is limited by metallizer’s power supply. Therefore, it is desirable that the boat be of optimum electrical resistivity so that it heats up slowly, allowing aluminum to melt on it and cause uniform coating. What is wettability of Evaporation Boat? Simply put, this is a measure of how the molten metal (aluminum, in most cases) will behave when in contact with the ceramic boat. Better wettability of the boat will mean improved quality in coating. Impurities in the evaporation boat can lead to poor wettability. Molten metal not spreading evenly, puddle forming, spitting etc. are some of the issues we face when the boat is not wetted properly. Although high wettability is quite desired, it comes at the cost of the life of boat. In other words, very high wettability leads to lower resistance to corrosion. Therefore, an ideal evaporation boat will have balance between wettability and resistance to corrosion. When aluminum liquefies on the boat, it starts reacting with boron nitride present in the boat and forms aluminum nitride and compounds of boride, thereby corroding the boat. With time, fissures, grooves and cracks form on the surface of the boat which results in premature failure of the boat. 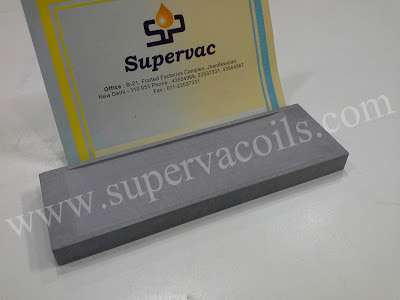 But if the boat is made with the sole purpose of resisting corrosion, it will hamper wettability. Hence, an ideal boat will have an optimum resistance to corrosion without affecting wettability. Ceramic Evaporation boats are of two types- 2 component boat and 3 component boat. Two component boats are made up of Boron nitride and Titanium diboride. Three component boats also have Boron nitride, Titanium diboride plus Aluminum nitride to bring down the cost. The following chart shows the difference between the two. 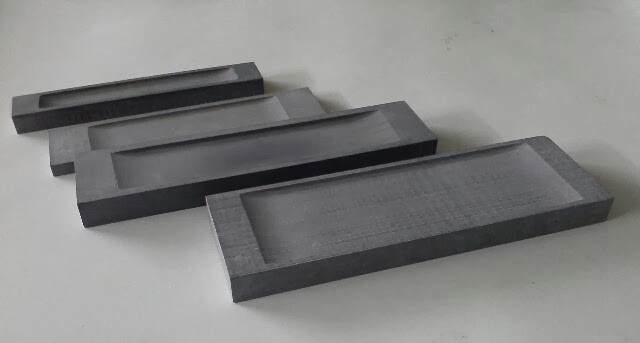 Since, the 2 Component boat exhibits better resistance to corrosion, it lasts much longer and its wettability is also good. Therefore, it makes sense to opt for it. Which shape of evaporation boat is best for metallizing? 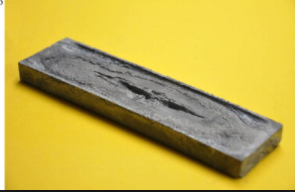 World over, the shape found to be best for metallizing is rectangular with a groove for molten metal in the middle. 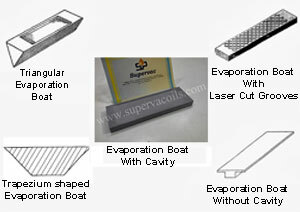 Evaporation boats come in various sizes. It cannot be stressed enough how important it is for the evaporation boat to have a long operational life while at the same time maintaining coating uniformity. 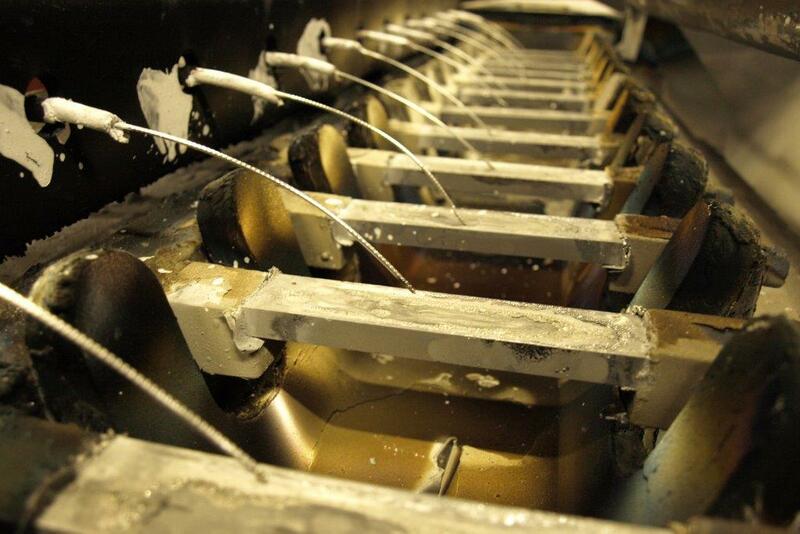 A good evaporation boat’s constituents will resist corrosion but also allow smooth and even spreading of molten metal. Going for low priced evaporation boat at the cost of boat life and quality of coating makes absolutely no sense. While you may feel happy on saving some money on the cost of the boat, you may actually be incurring huge electricity bills. Increase in machine down-time and overall cost of boats also goes up. On the contrary, going for very expensive boats also makes no economic sense. For roll-to-roll coaters, continuous and easy availability of evaporation boats is a necessity. Otherwise this leads to huge stock piles of inventory and blocking of lakhs of Rupees. Non-availability of boats has been known to bring the entire metallizing operations to a grinding halt. Operators of metallizers are often forced to place huge orders of evaporation boats many months in advance as the lead time of the supplier may be pretty long. This feels like a dagger dangling over the operator’s head, to say the least. It makes good business sense if your boat supplier’s lead time is short. That way, you don’t have to wait for long periods of time for your next consignment of boats to arrive. Optimize the Vacuum metallizing process in such an efficient way that you are able to get maximum yield/ throughput. I have, earlier, written a detailed article on the above topics. Article name: Evaporation Boat: Get your money’s worth out of it. How well the above points are taken care of, decides your optimum yield. Evaporation boat plays a major role in improving the quality of coating & our metallizing economics. Close attention must be paid in its careful selection and usage.